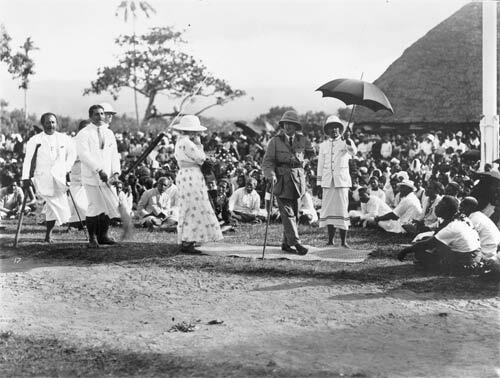 Colonel Robert Tate, New Zealand's second resident commissioner for Samoa, speaks to an outdoor meeting while protected by a sun umbrella, about 1920. He held absolute authority in Western Samoa as the Fono of Faipule, an advisory body of Samoan leaders, was not legally recognised until Tate's departure in 1923. Referring to the Mau movement for Samoan independence, Tate told the governor of American Samoa that much of the unrest was due to ideas of racial equality.